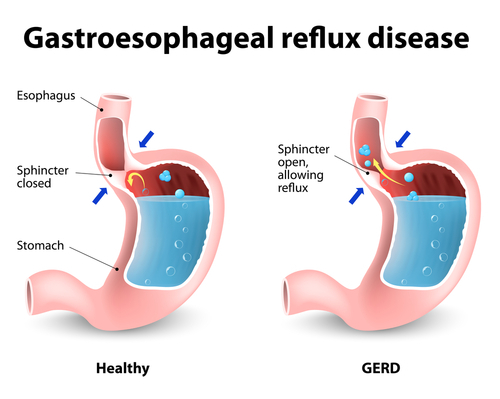 Heartburn or gastro-esophageal reflux disease (GERD) is a very common symptom for patients with pulmonary hypertension. Patients may experience chest tightness, burning, pressure or even cough and hoarseness. Often symptoms are worse after eating certain foods or lying down at night. What Causes Heartburn in Pulmonary Hypertension Patients? A quick review of the anatomy of our upper digestive tract is invaluable in understanding GERD. After we put food in our mouth, it passes to our esophagus entering though the upper esophageal sphincter (a specialized muscle that can open and close). The esophagus moves food downward to the stomach. The gateway to the stomach is guarded by the lower esophageal sphincter (LES). Under normal circumstances, the LES opens briefly to allow food to pass into the stomach and then closes. Acid secreted by the stomach begins to digest food. After food has been broken down adequately, it passes into the small bowel by exiting the stomach. The lower esophageal sphincter is key to heartburn. Unfortunately, this muscle does not always remain closed and stomach contents (acid and food juices) wash back into the esophagus. This process of food and acid re-entering the esophagus leads to the symptoms of heartburn. Many medicines and foods cause the LES to relax inappropriately leading to increased periods of reflux and symptoms of heartburn. Pulmonary hypertension medicines act on the lower esophageal sphincter and cause it to relax thereby increasing the frequency of stomach contents entering the esophagus. Your pulmonary hypertension medications are vitally important to keeping you healthy so we must find a way for you to tolerate your medications. The good news is that this is usually easily accomplished. 7. Raise the head of your bed about 10 inches. You can do this by purchasing a foam wedge and placing it under your mattress, or putting 2×4 blocks under the feet at the head of your bed. Heartburn is so common that the FDA has approved two types of medications over the counter. H2-Blockers act very quickly and are very safe. Common agents in this class include famotidine (Pepcid) and ranitidine (Zantac). They may be taken twice daily. If my patients have frequent heartburn symptoms, I encourage them to take the medication twice daily. If symptoms are infrequent, the medication may be taken on an as needed basis. A second class of heartburn mediations is called PPI (proton pump inhibitors). This large family includes omeprazole, rabeprazole, pantoprazole, esomeprazole and others. PPI pills should be taken in the morning before breakfast. In some circumstances, a second dose is taken at the end of the day. Long-term use of the PPI medications (especially when taken twice daily) can lead to an increased risk of osteoporosis and low magnesium levels. I generally encourage patients taking long-term PPI to also take calcium, vitamin D and magnesium supplements. If your symptoms of heartburn do not improve, you should check with your doctor.